Sixty five dollars a head may sound steep for a simple meal of haggis and neeps, but part of the dining experience is the atmosphere and entertainment. A portrait of Robert Burns greets patrons as they walk through the front door. To the left is the main dining room and to the right is smaller area with tables and a bar. From the wood paneled walls and bar top to the antler chandeliers,there is no lack of rustic charm. Specially arranged for the weekend are professional Scottish step dancers, bagpipe players, sword dancers and ,of course, no Burns celebration would be complete without a reciting of his famous verse, Ode to a Haggis.The entertainment is not the star factor that brings one hundred people per night to The Haven on Burn’s weekend, it’s the food. Bostonians only have two other options if an onset of haggis craving sets in. Once could either buy a prepackaged version from a butcher’s shop, or set aside 48 hours to prepare and cook the recipe by hand. The most logical choice for me was the labor free task of making the trip to the restaurant. The cooks at The Haven are enclosed into a small two-man kitchen that would not be big enough for Chef Mario Batali to fit in. 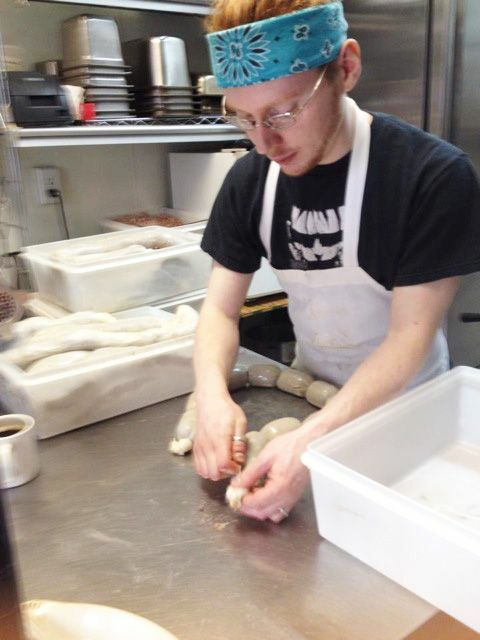 Angus Vickers, is a skinny 26-year-old line cook and the official haggis maker. How does one become a haggis maker? “You get a job at a Scottish restaurant and start making it,” he said. The Havens’ recipe is slightly different from the original. There’s is a combination of beef hearts, livers, and lamb kidneys. The organs are rinsed, chopped, and put through a meat grinder. The grey mixture is cooked with onions, oats and seasoned with thyme, all spice, black pepper, bay leaves, and garlic. This all occurs before being stuffed into the beef intestines, also known as middle. Vickers uses butcher’s string to pinch each round serving and throws the sausage strand into a pot to poach for 15 minutes. All that’s left to do is to cut and serve. For my friend and I, this meal was about to be breakfast. Sous Chef Justin Edgerton presented our plate. The haggis was garnished with a shaving of butter sticking out of the top and served on a bed of orange neep puree. We first went for the less intimidating neeps; It was a sweet tasting blend of turnips with honey, black truffles, vegetable stock, and a dash of salt and pepper. We exchanged uneasy looks as we remembered why we came all this way. I took one small fork full of haggis and expected the worst. To our surprise, it wasn’t long until we finished the entire plate leaving nothing but the casing like a deflated balloon. After that day, we both agreed that we would rather eat The Havens’ haggis than Taco Bell any day of the week.